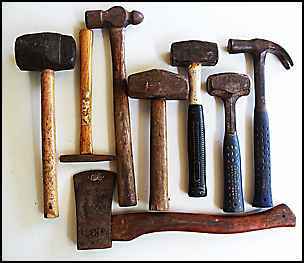 A selection of hand hammers that are in my tool kit. Mostly the claw hammer is the main one that gets used but the others are all used from time to time. Here are my hammers again and I will give you a brief run down on them, starting from the right to the left. A 24 oz Estwing claw hammer. After having owned heaps of claw hammers, I have settled for a steel shaft Estwing with a vinyl handle (the leather dries out too much in the tropics). I had my last one stolen and replaced it immediately with the same. My main hammer . An Estwing 4lb lump hammer, without doubt the best balanced lump hammer I have ever used. Lump hammers are used for heavy work, chipping concrete with cold chisels and bolsters. For jobs that need a bit more weight than my claw hammer. Another couple of lump hammers, the first has a fiberglass shaft and it is longer than the others, it gives a good powerful blow. Cheap and surprisingly good. The other is a typical wooden handled job of a type that has been going for centuries. (No doubt raised thousand of blisters in the process). I bought the 24 oz ball hammer for laying a 40mm thick floor with 75mm nails. Excellent tool for the job, long shaft more belt. It would also make a good framing hammer, using a pinch bar for removing bent nails. It has the original timber shaft, that has not dried out or moved over the years which is rare. Upside down is a small square faced cheapie pin hammer. If you are putting in a lot of small panel pin type nails (fixing beading around panels etc.) a smaller pin hammer is a lot better. For beading in glass, when driving in the nails I slide the hammer along the face of the glass. Next is a rubber mallet, cheap and crude but delivers a good whack without leaving a mark. I used it a lot recently when tiling my bathroom. Underneath is my carpenters axe, used mainly on formwork. Crude hammers create blackened thumb nails, so pick one that feels comfortable and well balanced. It can be cheap or dear, but make sure it feels good. For pulling out nails with a claw hammer sometimes it is better to put a block of wood under the claw to give you more leverage. It is also used many times to protect the main timber from damage marks made by the claw. If you have made a hammer mark in your nice timber, sometimes a bit of spit and a couple of light taps will swell it out again. Leave and back to home page.